What's cuddlier than a fluffy rabbit? 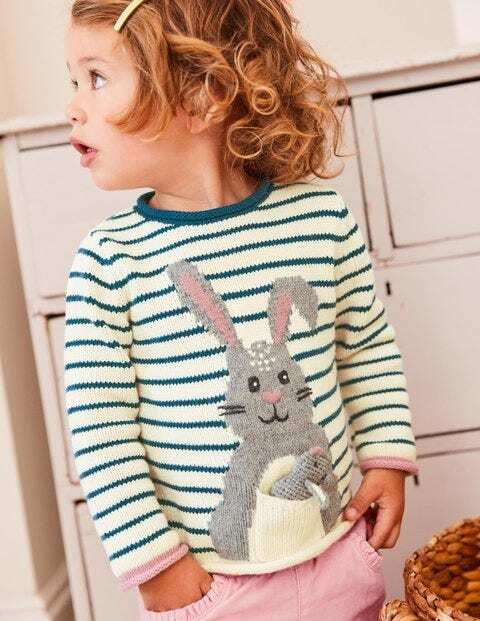 Your little one wrapped up in a merino-blend jumper, featuring a bunny and her 3D, knitted baby. Don't worry – our tiny pocket friend is secured with a ribbon, so it won't stray too far from mother rabbit. Even more adorable? This stripy design is machine washable. The thick merino wool-blend of the jumper will keep baby warm on chilly days, while back buttons make popping this on a breeze.